On a recent trip to Amherst, Mass., I strolled through the University of Massachusetts campus looking for a bookstore. There was not a book to be found, at least outside the 30-story library. A technology shop, yes. A natural foods store, yes. A pastry counter, yes. A university apparel store, of course. But a bookstore? For that, you have to travel a mile or so to the Amherst town center. The decision to eliminate a physical bookstore wasn’t popular among many students and faculty members, the Greenfield Recorder reported. Some students complained about Amazon’s business practices. Some instructors didn’t like submitting their textbook selections to Amazon rather than to a campus bookstore. And Amazon is never popular among local merchants. A few other colleges and universities have also eliminated their campus stores, including Purdue, Stony Brook, and Queens College. Others have kept their stores but allowed Amazon to install storefronts with lockers for one-day delivery. Amazon has pickup sites at 30 colleges and universities. One of the advantages universities cite for these arrangements is lower costs to students. At least that’s the plan. The university doesn’t have to devote storage space to books, and Amazon’s enormous size allows it to provide the benefit of scale and convenience. Amazon also pays the universities a commission on sales or rent for campus space. Amazon guaranteed UMass commissions of $1.45 million over three years, according to the Greenfield Recorder. Cost is no trivial matter as state support keeps declining and the individual costs of college keeps rising. UMass said its deal with Amazon was expected to save students $380 a year on textbook purchases, although the The Massachusetts Daily Collegian said students found that the savings were considerably less, especially because the free shipping did not apply to used books. Those arrangements also don’t take into account the efforts that campus bookstores make to assist students. The KU Bookstore, for instance, has created an online price comparison tool to help students make decisions. It also works with KU Libraries, faculty and staff members to make open educational resources more readily available. And it sends all its profits back to KU through donations to campus programs and organizations. Each campus bookstore has a different business model, but the money that Amazon promises to universities is increasingly difficult to pass up. At the University of Wisconsin-Madison, Laurent Heller, the vice chancellor for finance and administration cited decreased state funding as one reason the university found a deal with Amazon attractive, according to The Daily Cardinal. “We need to find creative ways to gain revenue that goes along with our mission,” Heller was quoted as saying. Those revenues don’t come without risk, though. At UMass, Amazon is ending its five-year contract after three years, according to the Recorder. That has left the university scrambling to find a book supplier for its bookstoreless campus starting next year. I have mixed feelings about all this. I’m not anti-Amazon, and I certainly understand the trend toward electronic course materials and the delivery of books. Libraries have been moving in the same direction, repurposing stacks as collaborative space for students and moving many physical books to remote sites. (This isn’t always a smooth process either.) The growth of digital resources also reduces the need for physical space. I’m certainly part of this trend. I do most of my reading electronically these days. With an e-book reader and a tablet, I read much more than I did before. The digital devices also make life easier. I can take and store notes without the need for physical filing cabinets, and retrieve them much more easily and accurately than if they were in paper form. The digital format also reduces space and makes large amounts of information much more portable. Campuses definitely lose an important element when a bookstore goes away, though. As I walked through the UMass campus, the lack of a college bookstore felt disorienting. It was as if something vital had been removed. Without it, there was no physical location for getting a feel for the intellectual life of the campus, no single place for perusing course titles or picking up new ideas from interesting classes and books that instructors had chosen. Without a bookstore, the campus felt somehow more remote, more inaccessible. I’ve written before about universities’ shift toward consumerism, about the way they have diminished the importance of learning by promoting themselves as carefree places with endless conveniences, cheering sports fans, and smiling students who seem to have little to do but stroll together across leafy campuses. 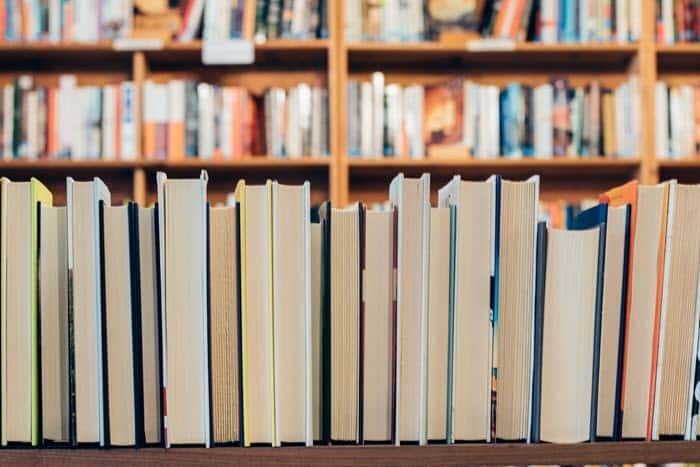 The loss of campus bookstores fits into that trend, further hiding the intellectual life – the soul of higher education – behind the gloss of consumer appeal. If we are to preserve that intellectual core, we need to work harder at making it more visible, especially for potential students and for the public. Otherwise, a campus becomes just a collection of buildings — buildings that at a growing number of universities lack a bookstore. Fort Hays State University is taking a non-Amazon approach to remaking its bookstore. The university has entered into partnerships with Akademos, a company that provides an online portal for textbook sales; and indiCo, an arm of the National Association of College Stores that will handle general merchandise for the store. … A University of Maryland study supports the idea of using virtual reality for learning, with researchers finding that participants had better recall of information from a virtual environment than from a desktop computer, Campus Technology reports. … A survey by the New America Foundation finds that support for higher education may not be as politically divided as surveys last year suggested, Inside Higher Ed reports. Even so, respondents were much more supportive of colleges and universities near them than they were of higher education in general. Cleve Moler meets with students and faculty members after speaking at Eaton Hall. 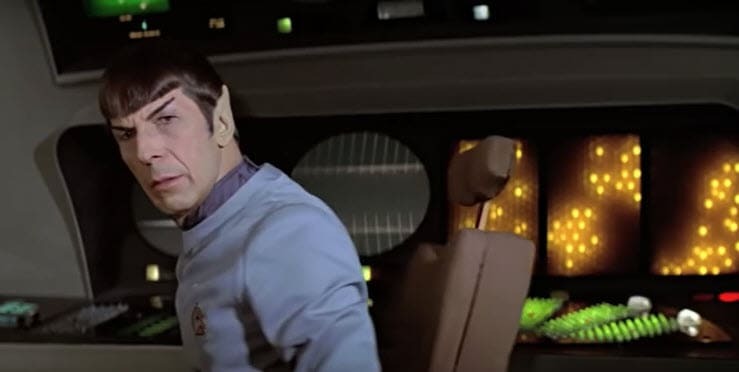 “Look over Spock’s shoulder,” Cleve Moler told the audience at Eaton Hall on Thursday. He was showing a clip from Star Trek: The Motion Picture, the 1979 movie that revived the classic 1960s science fiction television series. In a scene from the bridge of the Starship Enterprise, colorful graphics blink on a futuristic array of monitors. Those graphics, Moler explained, came from what is now the Los Alamos National Laboratory, where he was part of team that developed a computational math library and an accompanying library for computer graphics. That work, written in Fortran, was “just a matrix calculator,” Molder said, but it was the basis for Matlab, software that creates an interactive environment for computation, visualization, modeling, and programming. Moler, a former professor at New Mexico, Michigan and Stanford, is the “chief mathematician” and chairman of MathWorks, a company he co-founded in 1984. He visited KU this week, speaking to an auditorium filled mostly with undergraduates, but also with faculty and administrators, for the Russell Bradt Undergraduate Colloquium. I’m not a mathematician, so I won’t pretend to understand the intricacies of Matlab. What I do understand is that Matlab plays an important role in researching and teaching mathematics, engineering, and other STEM areas. It is an environment created by mathematicians for mathematicians, and it has attained near iconic status in the academic world, with more than a million users. In his talk at Eaton Hall, Moler spoke in a gravelly but upbeat voice about his influences in mathematics and computer science and about the steps that led to the development of Matlab. MathWorks, the company, started in 1984 with one employee, doubling every year for the first seven years. It now has about 4,000 employees in 20 offices around the world, Moler said. It has also expanded into such areas as cell biology, image processing, hearing aids, and driverless cars. Then his analytic side came out. Through those stick figures, he said, we can understand things like mood, gender, and personality just by observing the way they move, and researchers are using the animations to study how people perceive others through their walk. At 78, Moler doesn’t move nearly as smoothly as he did when he created Matlab, but his status as a math star was apparent at a reception in Snow Hall, where he sat with a cup of coffee and a cranberry oatmeal cookie talking with Professor Marge Bayer and others from the math department. Graduate students ringed the room, seemingly reluctant to approach Moler. They needn’t have worried. Despite his genius, Moler loves interacting with people, telling stories of his family and of the evolution of Matlab. 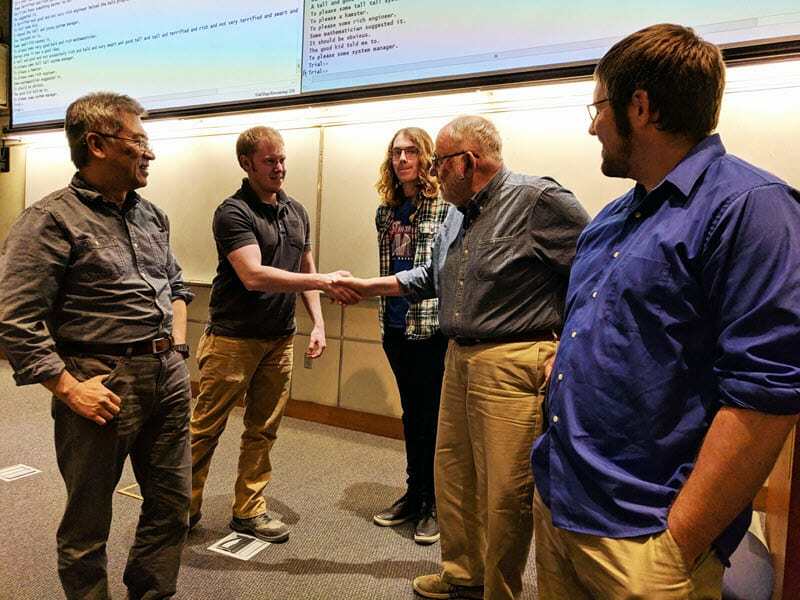 At the end of his talk, Moler made a pitch for his company, which he said was hiring 250 to 300 “good people who know Matlab.” It wasn’t quite the same as in invitation to the bridge of the Enterprise, but for young mathematicians, it was close. The liberal arts got a recent thumbs-up from an unlikely source: Mark Cuban, the entrepreneur, Shark Tank star, and owner of the Dallas Mavericks. “Unlikely” may not be quite the right description because Cuban encourages high school students to attend college and has a college degree himself (Indiana University business administration, 1981). So he is hardly part of the drop-out-now-and-chase-your-dream crowd of Silicon Valley entrepreneurs like Peter Thiel. Neither is he bullish on higher education, though. He has argued that colleges and universities are constructing unnecessary buildings financed by rising tuition, and that higher education is in the midst of a bubble, much as real estate was before 2008. In a recent interview with Bloomberg News, Cuban said that students needed to think carefully about jobs, careers, and skills. “What looked like a great job graduating from college today may not be a great job graduating from college five years or 10 years from now,” he said. That’s because machine learning and artificial intelligence are changing the nature of work. Companies are hiring fewer employees as technology takes over more jobs, making it crucial for people to understand how to use computers and software, he said. “Either software works for you or you work for software, and once the software takes over, you’re gone,” Cuban said. He predicted enormous changes in the workplace in the coming years. “The amount of change we’re going to see over the next five years, 10 years will dwarf everything that’s happened over the last 30,” Cuban said. Because of that, Cuban said he expected English, philosophy and foreign language majors and others who are “more of a freer thinker” to have a distinct advantage. “I personally think there’s going to be a greater demand in 10 years for liberal arts majors than there were for programming majors and maybe even engineering,” Cuban said. What is the point of higher education? “Students,” someone in the audience said. Cunningham is right, but the answer is more complicated than that. A university is an intellectual community with many different interests and goals that compete for the time of faculty members, staff members and students. Those include research, and service to the community, the state and alumni. At its heart, though, a university exists to educate students and to help them become mindful citizens. 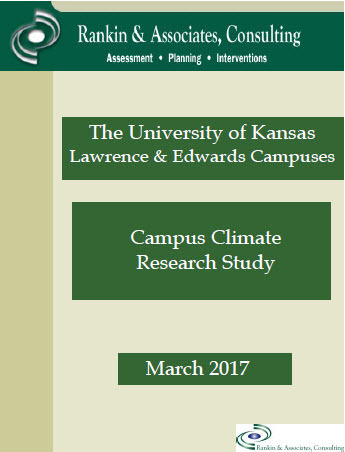 The full climate survey, along with an executive summary and the slides from Rankin’s presentation, is available for download. Although he stressed the importance of students, Cunningham failed to bring up a statistic that speaks to the value of students: Only 64 percent of tenured and tenure-track faculty members who took the survey said the university valued teaching, compared with 83 percent who said the university valued research. Among non-tenure-track faculty, those numbers were 63 percent 86 percent. Those figures reflect what those of us who value innovative, high-quality teaching already know: The rewards system is heavily weighted toward research. To say that teaching takes a back seat to research would be an understatement. Teaching is more like a trailer hooked to the back of a carefully polished SUV. Service, the third leg of the university’s three-legged platform of teaching, research and service, fared even worse than teaching in the survey. Service means many things, from sitting on governance committees to leading community events to participating in workshops to guiding junior colleagues. It also keeps the university running through administrative roles at many levels. In many cases, though, service goes hand in hand with teaching through such means as advising and mentoring students – responsibilities that are not equally shared. Only 45 percent of tenured and tenure-track faculty said they thought KU valued service, and 47 percent said they did more work to help students than their colleagues did. Women, especially, reported unfair distribution of service loads, with 50.4 percent of female faculty members saying they felt burdened by service, compared with 30.4 percent of men. “As one of the few women in my department I feel that I am tasked with more service because I actually do the assigned work,” one respondent said. Everything wasn’t gloomy. Seventy-seven percent of undergraduates and 83.7 percent of graduate students said they felt that faculty members valued them, and slightly smaller percentages (70 and 80) said there were faculty members they perceived as role models. Has the semester left you wrung out? Keep this in mind. A colleague pulled me aside this week and said she wanted my thoughts about something. She seemed apologetic. She is relatively new to college teaching, having made the switch to academia after a distinguished professional career. Students rave about her. She pushes them to think creatively and to stretch their abilities through hands-on projects. She holds students to high standards, but she is also accessible and serves as a strong mentor. When we talk, I always leave feeling energized and hopeful. This week, though, she seemed uncharacteristically down, and she wanted my advice. “How do you, a teacher of teachers, feel at the end of the semester?” she asked. I laughed before offering a brutally honest answer: Mentally and physically exhausted, I said. Morose and filled with self-doubt. I dwell on missed opportunities, worry about what I may have forgotten to teach, and wonder whether I have truly helped students. It’s not, I said. Teaching feels like both a sprint and a marathon combined. Each week, we dash toward short-term goals, never fully able to catch our breath as the pace of the semester sweeps us along. I felt much the same way as a student, pouring myself into my studies, gasping toward the finish line, and wondering whether I had made the most of my opportunities. I learned something then that I continue to draw upon now: Even though I felt exhausted and numb at the end of the semester, I had a chance to recuperate and rejuvenate. Academia, I found, had its own seasonal pace, its own cycle of depletion and rebirth. Every semester, I had a chance to start over. I try to hold on to that thought at the end of each semester now that I’m a professor. I also remind myself that my class is only one of many that students will take. As I told my colleague this week, none of us can teach students everything. Seeing end-of-the-semester projects with sloppy writing, weak research, haphazard connections and faulty reasoning may seem like failure, but it’s not. Each of us has only a small part in the broader learning of our students. If we have done our jobs right, we have helped students improve their thinking and their maturity, helped them gain confidence in their ability to learn, and provided strategies for helping them learn in the future. The work we do will help them improve on their skills old and new in future classes. I also remind myself that students are as tired as I am at the end of a semester and probably aren’t doing their best work or their best thinking then, just as I am not doing my best work or my best thinking. The end of the semester is a lesson in humility for all of us. My main advice to all faculty members is to be kind to yourself at the end of the semester. Take time to reflect: What worked this semester, and why? Most certainly you had some successes. What were they and how can you transfer those successes into other areas? At the same time, what didn’t work? What parts of a course do you need to change? What can you do to improve overall student learning but also learning in smaller components of a class? What activities or assignments can you change to boost students’ confidence but also help them improve on weak skills? After that reflection, take some time to relax and revive. Yes, you missed some opportunities this semester. We all do. No, students didn’t seem to learn as much as you would have liked. Do they ever? So give yourself a break. Do something that doesn’t require intense thinking. (I personally favor binge-watching “The Walking Dead.”) And remember that rare, magnificent part of academia: Next semester, you get a chance to start over.